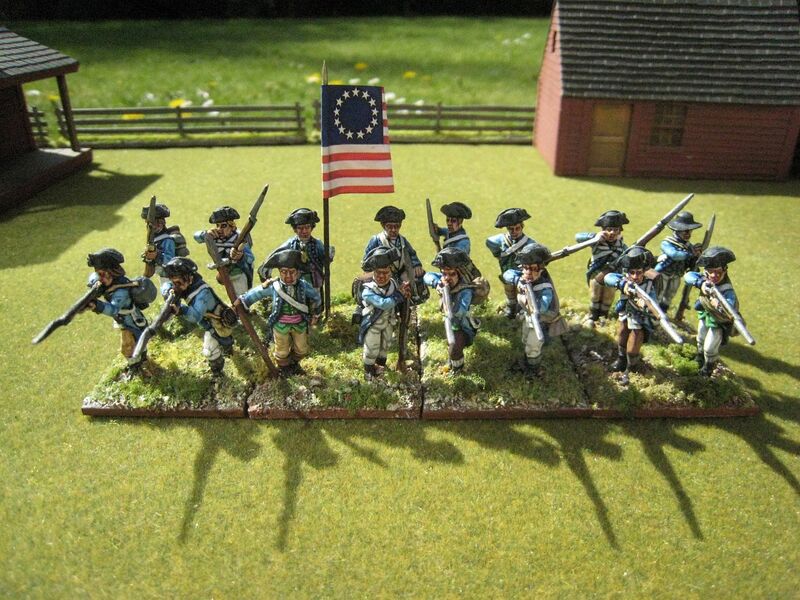 The 3rd Virginia was raised in December 1775 as a Continental Army unit. It lost its initial colonels, Hugh Mercer and George Weedon, to promotion within a couple of months and was then commanded for by Thomas Marshall. William Heth then led the regiment from early 1778 until 1781. 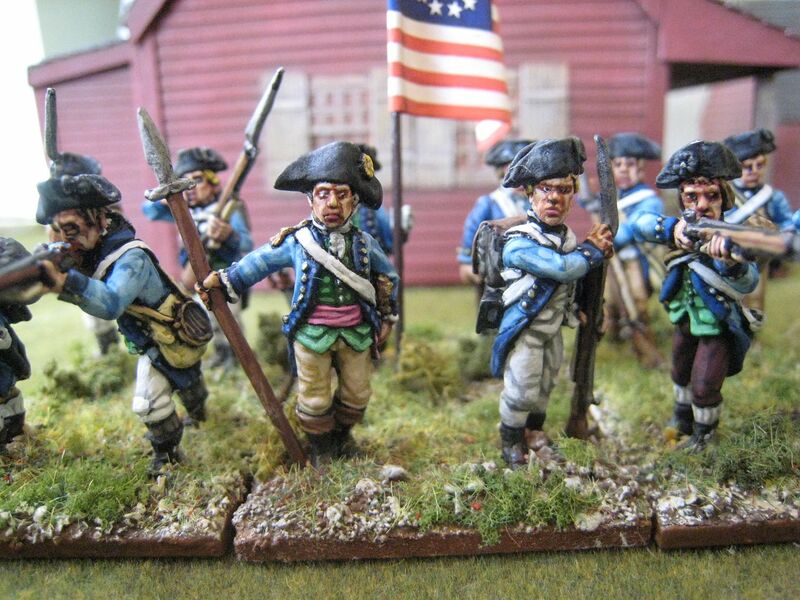 The regiment was engaged at Trenton, Princeton, Brandywine, Germantown and Monmouth. By 1780 it had been posted to South Carolina, and most of the regiment was captured when the British took Charleston in May of that year. Captain John Chilton left a number of letters and a diary of his time in the regiment, which were published a few years ago. 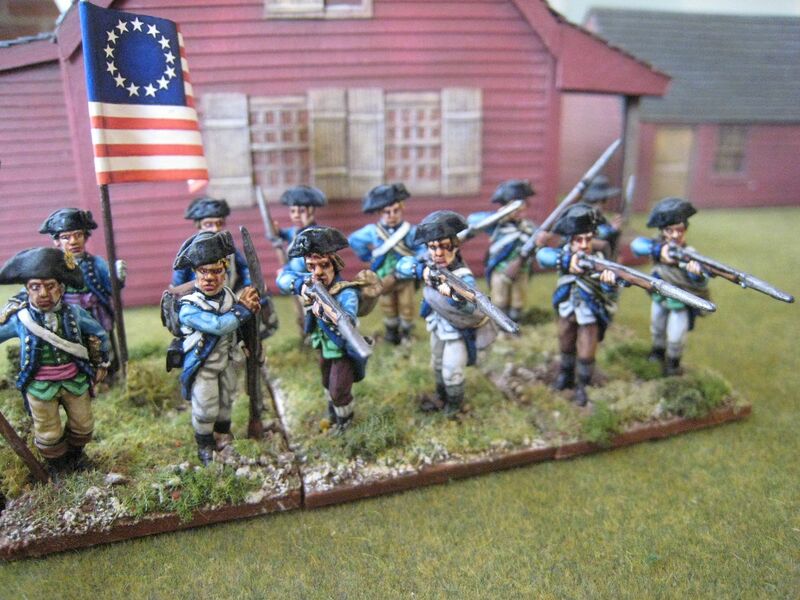 I painted two bases for this regiment in 2004. I then completely forgot about it until earlier this year, when I was deciding what to do with my remaining "firing line" figures; there's not much you can do with an 8-figure unit, so bringing it up to strength was an obvious use for my odds 'n sods. These are largely Foundry figures, with a couple of Perries and one Eureka ragged Continental. 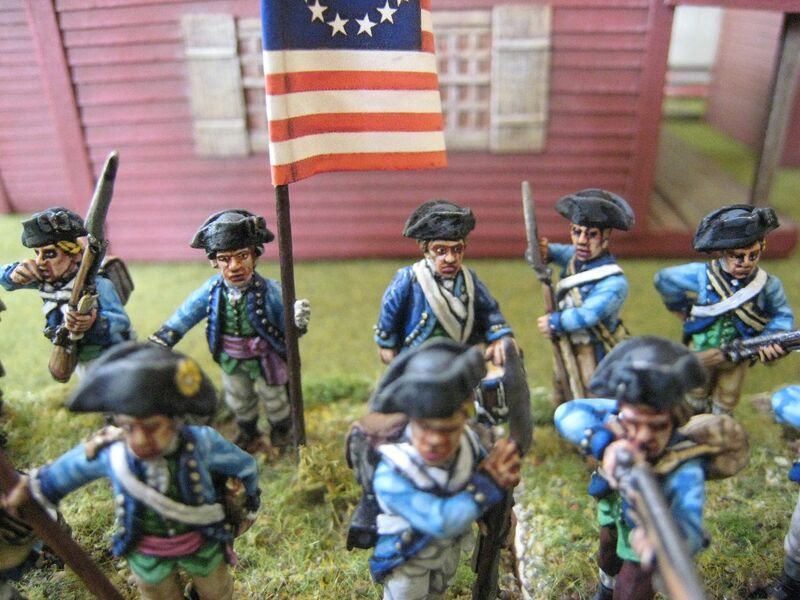 The uniform colours are from the Zlatich Osprey MAAs - light blue coats faced blue with green waistcoats. That sounds pretty outlandish, and I think it was initial scepticism about the colour scheme that led to my initial downing tools on this unit. So for most of the new figures I dropped the green waistcoats. 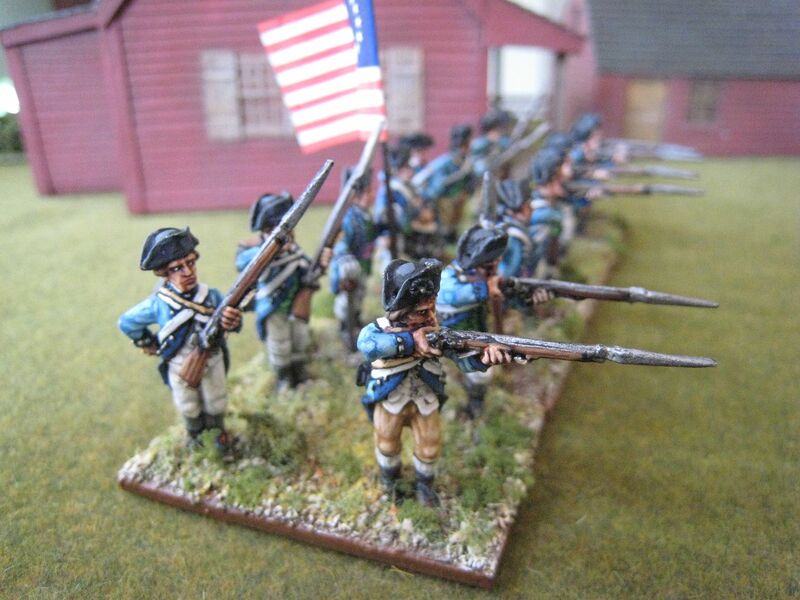 So I don't really know how accurate this portrayal is; but it's colourful at least and other regiments certainly wore light blue coats (such as the 2nd New Hampshire). 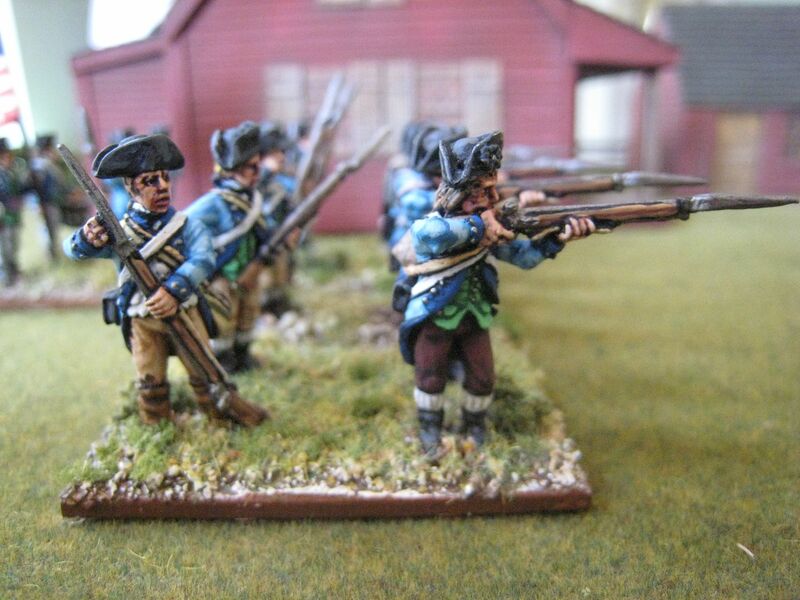 My painting style and the paints I use have changed since 2004 - the dark blues on the earlier figures, for example, were highlighted with a long-vanished Citadel colour, which is different to the Foundry "Deep Blue" triad that I use nowadays. 16 figures. Painted 2004 and January 2017. Flag by GMB. Light blue and green? I like it! The light blue with dark blue facings ain't bad either. Lovely figures as always. That's a smart looking unit. Well worth completing. Wonderful looking regiment Giles! Fortunately American uniforms vary so much you have plenty of latitude to take liberties and do as you wish which is one of the reasons I enjoy the period so much. Very nice. I think Patriot units were not as uniform as we would like to believe. Certainly early to mid war, so I believe Quatermasters used any available clothing they could get their hands on. They will do for me Giles! Informative and interesting as ever, keep it up! Very nice Giles! I think they look quite spiffy. Are you going to Salute this weekend? 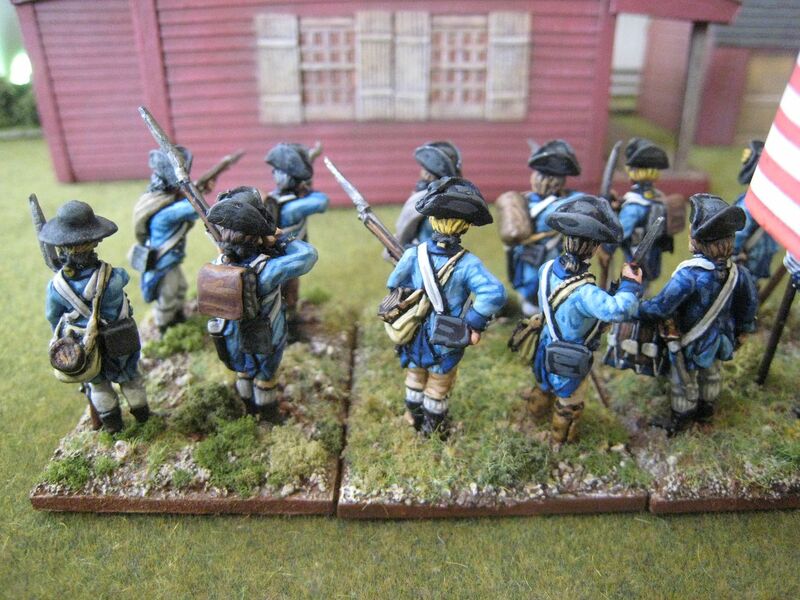 Great shading work on the light blue - really sets them off nicely.